ROAD TOWN, Tortola, VI – Youth leader and former Youth Minister for Tourism Bryan Leue believes the notion that youth are the leaders of tomorrow needs to be dispelled worldwide in order for them to take their places today. 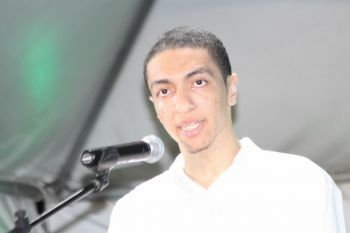 The grandson of the late Chief Minister Cyril B. Romney, Leue was the special youth guest speaker at the Virgin Islands Party (VIP) Youth Rally on Saturday June 6, 2015 organised by the Ready Committee and geared to be a forum for the youth of the territory where they will hear the plans of the party for youth. “I believe that this blanket statement that has been made at almost all youth forums across the globe from the United Nations to Caricom, the European Union and others should be challenged. We as youth are leaders of today…we do not want to be seen as up and coming and therefore not quite ready,” he said. Leue said the youth of today are not indifferent and not removed from reality. “We are the most dynamic human resource that will contribute positively to our islands and as such must be afforded the opportunity to be involved in national development, of Government, and of the stakeholder,” he said. He said that it is a question of empowering themselves about the country’s future and how this is to be done and what tools are needed. The young man said young people want to and need to meet with policy makers. “Too often we are seen as problems instead of assets. Resources offered to us are often seen as being a cost rather than an investment,” he said. He said that youths be provided with the infrastructure and the environment to go with the education so that they can be able to positively contribute to the growth of the society and be able to have a say in things that affect them. According to Leue, young policies must be inclusive, participatory, gender responsive, comprehensive, knowledge based, informed by evidence, fully resourced and accountable. He called for the opportunity for youths be enhanced so that they do not have to go to greener pastures to fulfil their dreams. He said that youths today have many challenges, noting that many are juggling academic and work responsibilities and also volunteering in the community. “None of us has escaped the impact of what is happening around us, but we can be a part of that impact. The youths should be held partly accountable for their own development, but also should be ready to volunteer their services in the community. We should be willing to work in the name of conviction and not in the name of recognition,” he said. Leue called on youths to be disciplined and united to face the inevitable challenges and opportunities that their communities will have in the coming decades. “We will act with courage, living in the conviction that we can and we will fully participate in our national development. We will demand the right to be fully included in the decision making process…” he said. It is believed that many youths who would have turned 18 by the end of the year have been disenfranchised by the hurriedly called snap election today June 8, 2015. Is this young man implying we must turn the world over to them TODAY? I agree they should participate and be involved so they can gain experience and exposure, but are we to let them call the shots today??? Goodness gracious! At username "??? ", I made no implication that the "world must be turned over to us". I am not under the illusion that youth can do this alone, nor that youths have the first and last say in what happens in this country . I am of the opinion that youth, along with the rest of the community, can do this together; that means there should be no exclusion of any stakeholders in the decision making process. I am pleased to clarify this for those of you who may have been confused at my statements. It gives me great joy and hope for my beloved homeland that there are indeed articulate and right-thinking young people who recognise that their role in this community is one in which they have a stake NOW. Thanks for the clarity, and if I understand your explanation correctly, I can now support your views. Great speech Bryan! I see in you a future politician or a great teacher! The way you gave your speech and moreover your comments to us adults to make us understand what you really mean: The adults and the youth to work side by side. The adults are never too old to learn and the youth neither too young to understand. Go for it Bryan!